Take a look at the American League -- not just the Central -- and ask yourself if the Twins could realistically build a World Series contender for 2019. Is the next real competitive window now, or sometime in the future? I’m of the mind that there’s no place worse to be than in the middle of the road. I also believe the foundation of a World Series team is in this Twins organization right now, but to realize that potential the front office and developmental departments are going to have to play their cards just right. The way I see it, the Twins have two options: 1) Try and go for it again in 2019 and build around the current roster, or 2) work to set things up better for 2020 and beyond. Sure, there are some moves that would accomplish both of those things, but I don’t envision the Twins signing a Bryce Harper or Manny Machado. Instead, I believe the best way to realize that eventual World Series potential is to continue to stockpile depth for 2020 and beyond while at the same time creating more opportunities for the young players who either debuted in 2018 or were in the high minors showing signs that they were close. I can already hear the groans as I’m typing this. I understand why a lot of Twins fans won’t take kindly to this blueprint. When the rebuilding will ever stop? I’m more curious if it ever truly started in the first place. The most frustrating thing about the Twins under Derek Falvey so far has been all the half measures taken. The first offseason, the team’s biggest need was addressed in the signing of a catcher, but there were no other efforts to upgrade the club. Then there was the buy/sell move at the trade deadline later that season, one of the biggest examples of indecisiveness I can ever recall by any front office. Last winter (and even into spring), there was another honest effort to upgrade the team, but primarily in the short term. Given that was the case, it was all too easy to tear down the roster at the deadline. Even how they’ve treated the manager situation has been very half-hearted up to this point. Falvey had no choice but to accept Paul Molitor as manager, but the three-year deal he signed after the 2017 season appeared to have been a commitment to stability in that spot. We all know how that turned out. I’m not saying I disagreed with all those moves, but taking a look at the big picture, you’re certainly left with an image of a leadership group that’s done a very poor job at committing to anything. Flexibility can be a valuable attribute, but at some point this front office is going to need to pick a lane and stay in it. The next big wave of Twins talent is topped by Alex Kirilloff, Royce Lewis and Brusdar Graterol. It’s conceivable all three could be September callups this coming season, but it is more reasonable to expect all three arrive in 2020. But those are just the headliners. There will be plenty of other prospects who will blossom between now and then. There will be a ton of seeds all continuing to germinate in the high minors next season. Not all of them are going to maturate, but It seems likely the foundation of the next great Twins team will come from that crop of players. As we’ve seen with the current wave of homegrown Twins, there will be some who surprise and some who experience more growing pains than we expect. But where does that leave the current team? The great news is several of the players on the team right now will still be under team control long enough for there to be some overlap with the next wave. Eddie Rosario and Miguel Sano will be around through 2021. Jose Berrios, Jorge Polanco, Max Kepler, Byron Buxton and Taylor Rogers will be around through 2022. Before we get going, this blueprint is in some ways a companion piece to the article I wrote for the Offseason Handbook. You may understand where I’m coming from a little better if you read that piece. OK, let’s get into my moves. Brace yourself, this might hurt. Everybody gets tendered a contract! I'm going to be both removing some outfield depth and some veteran leadership, so Robbie Grossman still makes plenty of sense on a one-year deal projected to be around $4 million. With Ehire Adrianza, the Twins are so shallow in the infield right now that I think he’s worth hanging on to for the projected $2 million. Free agency? No thank you. I’m going thrift shopping, and not for the Lance Lynn/Logan Morrison types. We’re talking bottom of the barrel. There have been some real valuable pieces acquired over the past several offseasons among the players who were non-tendered or became minor league free agents. The Twins saw both sides on the coin in terms of minor league free agents last year. They lost Dereck Rodriguez to the Giants, but added Willians Astudillo. You’re really mining for diamonds in the rough in this universe of players, but when you hit it’s an incredible value. You get multiple years of team control on a player who’s going to be affordable. You’re probably not going to find stars among the guys in this market (though it does happen), but a multi-year role player or bullpen piece would be a really savvy pickup. We don't know who will be non-tendered yet and I haven't scoured the list of minor league free agents to be, so I don't have specific names, but this is definitely an area in which the Twins should be aggressive. Trade away Max Kepler, Kyle Gibson and Jake Odorizzi. Here’s the knockout blow. This would hurt. Gibson was a rare bright spot from the 2018 season and one of the most likable guys on the team. That level of attachment isn’t there with Odorizzi, but he had a very nice season and turning over two-thirds of the established rotation would be very tough. On the other hand, Gibson, Odorizzi and Michael Pineda (more on him in a minute) are all set to become free agents after this upcoming season. Dealing away Kepler has the kind of disaster potential that could get somebody fired. It could end up being Aaron Hicks all over again. So why deal him? Well there’s already an argument to be made that Jake Cave deserves regular playing time over Kepler in 2019, but this has as much to do with making room for Alex Kirilloff than anything. It seems highly likely Kepler will be passed up one way or another. Why Max? Eddie Rosario is already what I think we all believe Kepler could be at his peak and trading Byron Buxton has even more disaster potential, mainly because his value is so low right now. Cave showed promise, but his track record is too short to garner any real trade value at this point. Trading Kepler has the best balance of potential risk vs. potential reward among the current crop of outfielders. The Twins have invested more than 1,600 plate appearances in Kepler and have seen very little progress at the plate. 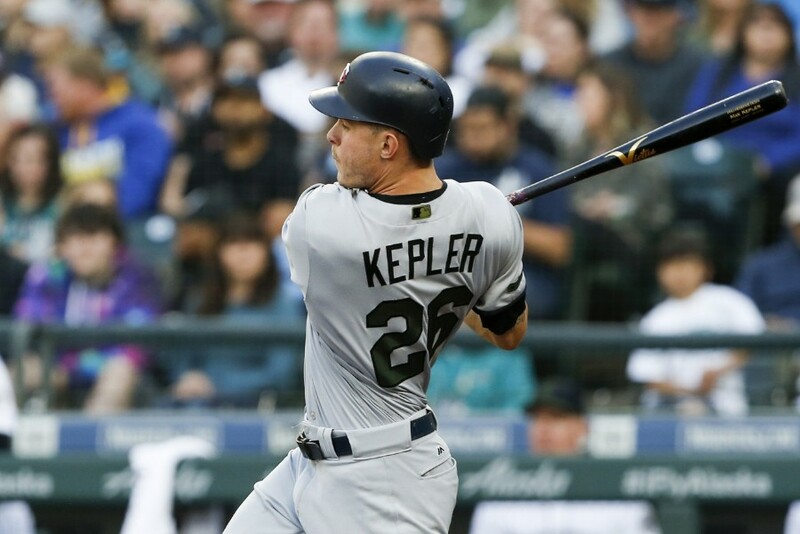 Being a strong and versatile defensive outfielder who is affordable and has upside, Kepler still figures to have plenty of trade value despite his lack of progress to this point. Make sure you grab a copy of the Twins Daily Offseason Handbook, which features an excellent article on Kepler written by Aaron Gleeman. The primary reason for listing these guys as trade bait is because they’re valuable. This isn’t a knock against them, if anything it’s quite the opposite. I think they could be flipped for additional pieces that help usher in a glory run in Twins Territory. So what would I be looking to acquire in these deals? Primarily infielders and high-velocity pitchers. The closer to the majors the better. The Twins don't really have a second baseman right now and I'm not sure anybody believes that Miguel Sano is going to stay at third base long term. On the pitching need, velocity isn’t everything but it sure helps. Plenty of pitchers are effective in the low 90s, but if you watched the postseason you know the Twins are seriously lacking in high-velocity options. Throughout the entire year, only a grand total of four pitches were thrown 98.5 mph or harder by the Twins staff, three of which came from guys who are no longer in the organization (two from Pressly and one each from Fernando Rodney). In the five World Series games there was a grand total of 97 pitches thrown at least 98.5 mph. Alright, let’s get into specifics. It’s nearly impossible for me to sit here and try come up with actual trades that make sense. The trade market is a mysterious beast. I did my best. My general theory was to take what I think the Twins could get, then lower that expectation a bit. A consensus top 100 prospect last offseason, Jones hit .239/.337/.380 (.717) between High A and Double A. He was primarily a center fielder prior to being converted to second base last season. He still has some things to iron out at the keystone, but I love the fact that he has some flexibility. Jones doesn’t have a single tool that projects to be below average. He’s currently turning heads in the Arizona Fall League. Middleton, a right-handed reliever, has the ability to sit 96 mph and topped out at 99 for the Angels last year. He has a 3.43 ERA, 9.4 K/9 and has even racked up nine saves in 76 major league innings over the past two seasons. He's a guy that could finish off games for years to come. The catch? He had Tommy John surgery in May. Another right-handed reliever, Jewell is also coming off an injury. He suffered a fractured fibula while covering home plate, but should be recovered sometime in December. He made his MLB debut for the Angels this year and topped out at 97 mph. He hasn’t posted big strikeout rates in the minors despite the velo, but Jewell gets a ton of ground balls with his hard sinker. Every year you have a Mike Trout in your organization is a year you need to be going for it, so the Angels have that incentive to improve. Shohei Ohtani had Tommy John surgery, but for now they’re expecting him to be available to DH next season. It’ll be interesting to see how that goes. The Angels do have Jo Adell, one of the top outfield prospects in baseball, but Kepler is a guy they can bank on to at the very least deliver similar production to what he’s given the Twins the past three seasons. There’s a lot of value in that to a team like the Angels who have question marks. Erceg, a left-handed hitting third baseman, is coming off a disappointing 2018 season in which he had a .688 OPS for the Brewers Double-A affiliate. He dealt with back issues in spring training, then was hit in the head by a pitch in April. Not sure if those things caused a slow start but they certainly couldn’t have had a positive impact. He played much better over his final 57 games of the season, posting a .761 OPS while slugging eight of his 13 homers on the season. In more than 500 plate appearances, Erceg had just 82 strikeouts, and there are no questions about his defense or especially his arm strength at third base. I think he’s also going to hit for power. Milwaukee had an incredible run this past season, but they need starting pitching help. Erceg is among their better prospects, but even with Mike Moustakas hitting free agency they still have Travis Shaw to play third base. Again, Gibby's only under contract for one more season. White posted an .838 OPS in Double A last year while playing second base, shortstop, third base and even a little bit of center field. He has an advanced approach at the plate, but his tools aren't loud. Seems like the type of guy who, if he develops, could be a nice utility player. He's putting together a strong run in the AFL right now. Oakland’s already pretty stacked on the infield, but they could really use some more starting pitching. Billy Bean has indicated that payroll room won’t be an issue for the A’s in 2019, so they should have no trouble finding room for Odorizzi’s salary. This would be the fourth time Odorizzi would be traded. Trade Jason Castro, Michael Pineda and Addison Reed at the deadline. Unlike the names I mentioned above, this trio needs to build up value before teams are going to give up anything of significance to acquire them. All three need to prove that they’re healthy. Castro needs to show his knee is fully repaired and ready for the rigors of catching. Pineda’s arm should be recovered, but he’s now coming off knee surgery. Reed ended last season on the active roster, but his velocity dip is a huge red flag. All those question marks may dissolve with a few good months, and if that happens these guys could be hot commodities at the 2019 trade deadline. Depending on how things are progressing, at some point it would probably also make a lot of sense to trade away Trevor May, who’s only under team control through 2020. Ouch. That hurt to say too. What about all that money coming off the books? The big concern with implementing a plan like this is the message you’re sending to the guys you want to keep around. The best way to ease their minds would be to engage in extension talks with virtually every player you see fitting into the big picture, long term. You’re not going to work out a deal with all of them in one winter, but if you sign a couple extensions and at least show the other players you’re willing to invest in them further, I think the tear down becomes an easier pill to swallow. With this blueprint, it would definitely be possible to front load some extensions, providing guys with significant raises right away. I'd have to think that would be a nice motivational tool. I'm going to avoid throwing out any specifics here. If the trade market is a mysterious beast then projecting extensions is a mythical creature. Rotation: Jose Berrios, Michael Pineda, Adalberto Mejia, Fernando Romero and the winner of the fifth starter spring training battle royale. Bullpen: Trevor May, Taylor Rogers, Trevor Hildenberger, Addison Reed, Oliver Drake, Gabriel Moya and Jake Jewell. Among the candidates for the fifth starter would be Kohl Stewart, Stephen Gonsalves, Zack Littell, Chase De Jong, Aaron Slegers, Lewis Thorpe and any of the bargain free agents. Out in the bullpen, Tyler Duffey, Alan Busenitz, John Curtiss, Matt Magill and Andrew Vasquez would all also be in the mix plus any of the thrift shop additions. This team might honestly get the Twins into hot water with the MLB because the payroll would be so ridiculously low. At the same time, I also think this team could probably still finish second in the AL Central in 2019. If Cleveland collapses and this team somehow finds itself in first place at the deadline, the front office would have both the payroll room and prospect capital to make some massive moves if they saw fit. Yes, I'm basically going to dare Nick Gordon to take over as the everyday second baseman. I know he had a terrible end to 2018, but that seems to be a bit of a trend for him. Adrianza is there and in this scenario you'd also go out and acquire another bargain bin insurance option a la Gregrio Petit. New additions Jahmai Jones and Eli White would be back in the high minors to start the year, but could pushing for promotions in the second half. If Gordon falters, one of those guys is next up. If nobody sticks come July ... Royce Lewis time?!?! Lucas Erceg would also be knocking at the door and would push Miguel Sano to a 1B/DH role upon his arrival. Out in the bullpen, Keynan Middleton would join that unit sometime in the second half once he was recovered from TJ. Even with trading away Kepler, there's still enough outfield depth that allows LaMonte Wade to start the year back in the minors. Brent Rooker would also be waiting in the wings for a shot at 1B/DH. This team would look a heck of a lot different after the trade deadline. There’s no way the Twins would do anything similar to what I’m suggesting here, right? Well, two moves made later this past season indicate to me that this front office already has 2020 vision. If they thought this team was going to be a legit contender next season, I don’t think they would have traded away Ryan Pressly and they would have prioritized getting Buxton more plate appearances in September over gaining another year of team control. Throughout the coming days there will be more blueprints offered up by others here at Twins Daily. I bargain that most of them will focus on how to build this team up to compete in 2019. I’m looking forward to seeing what everybody comes up with, and it’s possible that I’ll fall in love with someone else’s blueprint even above my own. Again, the one thing I want to see from the Twins going forward more than anything else is decisiveness. If they’re going to go for it, dive in head first. No more half measures. Please let me know what you think of this blueprint. If you’d like to take a crack at building a blueprint of your own, I think I speak for the entire Twins Daily community in saying we would love to read it. The best place to do that would be in the blog section or in the forum thread Nick started. I am completely with you on the theory that being caught in the middle is worse than either extreme. That was probably Terry Ryans biggest weakness, although he likely preferred the term "competitive"? I don't want the Twins to be able to possibly compete with Cleveland for the Central title, or for the #2 WC slot. I want them to be able to complete for the whole deal. Watching the teams involved this year leaves one with a clear vision of how far away we are from that goal. That is if we could see that far. Don't cobble together something in 2019 for another faux playoff run. Hoping that another year of rebuild won't happen won't make the necessity for one go away. Nor will the Twins ever walk away with a major difference making FA. Wishing for, or operating on, that happenstance is both disappointing and foolhardy. Take the time to build a solid foundation, draft and develop, and move pending FA for something more that lottery choices. That's the sensible process in this market. Which leave this remaining question: Can Falvine acoomplish it? To that matter, the jury is still out. We're currently "enjoying" the fruits of what was universally called one of the top 3 farm systems in baseball. Why will the next rebuild be better than that one? This organization's had a top 5 farm system for more years than they've been a top 5 MLB team. You will never find me saying “we don’t have anybody who matches up to Clayton Kershaw so let’s not trade prospects for renting Someone who MIGHT be the guy who catches fire. That doesn't interest me. I want the Twins to go get their guy who can match up with Kershaw, Sale, Verlander, Kluber, Severino before the season even starts. If none are available, then they better figure out how to get Berrios or Gibson to the next level. This team has been crossing their fingers and doing 'MIGHT win' all this century and it has yet to pay off. They need to start doing 'SHOULD win'. And the pitching angle is only one path, if they're able to get the bats to be an onslaught of destruction that can overcome awesome pitching, fine, I really don't care how they do it, just be an elite team. I'm just so tired of being the cute underdogs and the team and the fans eating it up. There were only four playoff teams in 1987 though. The 2006 Cardinals which had future HOFers Albert Pujols and Scott Rolen in their primes never had to win a play-in game. Today's game is asking the Twins to win FOUR different series against superior teams to take the crown. I'd rather the team stop settling for the chip-chair-and-a-chance odds and start making their own odds by drafting, developing, signing and trading for an actual elite team so as they don't have to play the part of the scrappy little underdog all the time. In today's game I don't know that a team can do the chip-chair-and-a-chance method while they build for the elite team. And I'm not even saying the team can't make the right moves to become elite this year. I just don't want them to take half measures and sacrifice a legit chance at winning it all in the coming years so we can cross our fingers for a .500 season and a measly AL Central crown this year. I am not sure why we think the next set of prospects are going to turn out better than the current ones in the majors. I'm not sure why we'd plan on them not doing so....At some point, the team needs to trust its processes (or drastically change them, which this FO is). Your other option is to pretty much quit, really. I was alive and have vivid memories of 1987. I remember the Cards in 2006 and the Giants and the Royals. Any team that makes the playoffs can win it and have. In not just baseball but Hockey and Football as well. If we keep trying to win the game on paper first... we might as well give up now. That's one way of looking at it. But, I'd disagree in this era...or at least at this particular point in AL history.2019 isn't going to be anything like 1987. Three great teams in the AL and (at least) one extra round to negotiate in the playoffs. The AL was anything but unpredictable in 2018, and will be similar in 2019. Houston, Yankees, Boston, are not good teams, they are championship-caliber teams that are not all going to fall of the table in 2019. Meanwhile, the Twins are not currently in the universe of these 3 teams. Could the Twins go all-in and steal a central-division crown in 2019? Maybe. I'd just as soon see a plan to REALLY compete, and to do so for an extended period of time with young and controllable talent. I'd love it if that plan gave us a chance to win 90 games in 2019. But if it doesn't, it doesn't. Both of you seem to be saying the same thing so I'm replying to both. I hope not to be misunderstood... I'm all for loading up the roster with as much quality as you can in the off-season to increase your odds of going all the way through. I am not saying that we should just settle for Jake Cave and pass on Pollock and just try to piranha your way through, all the way to the finish. I've lost count on how many times I've typed... give me 25 guys who can play so hopefully, I'm believable when I say it. Ultimately, I want my Twins to look like the Astros and Dodgers currently look on paper. But, if you guys are looking at a team in contention in July. A team full of piranha's and it's Jake Cave leading the way... if you are both saying we shouldn't bother trading a prospect to acquire Justin Verlander because the Astros are just so loaded. If you feel there is no point because the roster doesn't compare to what Boston is putting down on paper... therefore let's not sacrifice our future to take a shot when the team you currently have are earning that shot...We are in 100% disagreement. The Playoffs are 20 games max. You just got to go 12-8. The Orioles could go 12-8 in their current state at any time and are capable of going 12-8 at any time against the best of the best or the worst of the worst and it just might be Renato Nunez who hits 6 home runs at key moments that leads the way. You never who is going to step up or if the paper tigers on the other side are going to experience the bad timing of stepping down at the absolutely wrong time. We just got done watching the Brewers take the Dodgers to Game 7 with a rotation of Chacin, Miley and Gio Gonzalez. A rotation that completely shut down the Rockies before doing decently against mighty Dodgers. Was it the Rockies just not hitting as a team at the moment or did Chacin and Miley just kinda find it at the right time? I don't know but it kinda happened to the Dodgers as well and things like this happen every single year. Meanwhile Kershaw and Ryu fronted the Dodgers rotation and finished 3 wins and 5 losses combined while allowing 25 runs in 49 innings. These paper assessments don't mean much in a 20 game sample size. So acquire some additional help if your team has a shot. Energize them the best you can. You never know what player becomes Eovaldi or what player becomes Darvish but you should try. Never pass on a playoff race because you think you know better. Load up in the off-season... see what happens... If you are contention... load up some more. If you are not... sell off the expiring contracts for more farm options. And even if you don't load up in the off-season and somehow, someway, through voodoo, crazy hops or found light-switches your scrappy team is in contention for a playoff spot... never ever ignore it. The players will let you know which direction you need to go and if they are telling you by their Wins and Losses to go for it... Join them. As for this off-season... I see absolutely no reason to look at what we have and look at what Boston, Houston and New York have and then just throw in the towel to focus on 2020 instead. If I was the Orioles... Yeah... I'd sell off and kick that can down the road. The 2019 Twins should enter the season with plenty of pitching depth, players with talent who are cheap, controllable and could collectively find the light switch, with money to spend and minor league talent that can acquire additional talent... plus... what should be another year of a weak AL Central. BTW... To avoid any confusion... I'm not saying we should trade Royce Lewis for David Freese to support the team. I always remain hopeful that the front office has some common sense along those lines when it comes to supporting a team. I just got done listening to Chad Allen on Mike Berandino pod caste his discussion on Buxton which I found very interesting and has given me some hope for this group of players the Twins have now. From what I took from Chad Allen's remarks Buxton needs to have playing time to get himself squared with hitting. Reading between the lines this Front Office has overloaded him with to much information and try to micro manage him until he has lost all confidence in his ability. I wonder if that is not going on with Sano too where they just need to play let them figure things out even if the numbers are poor for awhile and they need to have trust with their coaches. Second he talked about was this group of players just tore up minor leagues won everything but they haven't been able to make this work at major league level. The question I have is this front office of geeks overloading these young players until were not getting any performance out them at all. Soon as they go else where we see this dramatic improvement in performance. I read where Flavey and Levine are down in club house a lot after every game I wonder if we got case of micro managing going on here. Maybe this will change with their own manager but my guts tell me this will probably not change. I wonder if this case of these young stud geeks who did this with their other organization for their jobs now can't let the people they hired do their jobs because they are still doing what they had done before. This could be case where they haven't had experience of being managers let people do the jobs they were hired to do maybe not the exact way you would do but capable of getting the job done. If this case this front office is going to go down in flames because having multiple coaches voicing differences through out the organization creates lack of direction and confusion through out the whole organization. A little more speculation is this why they are firing people through out whole organization because people can't do it exactly how they think they would do it. If this case were going to have players, coaches, and training people who either waiting for directives and players overwhelmed with information and not being helped by people hired to do so because they are waiting for upper management for directives. I guess time will tell here but my feeling is this is like when the Twins hired Ray Miller from Baltimore Orioles we had team that wasn't performing and players and staff were never on same page. But getting back to Chad Allen I was impressed with his remarks and I think its worth listening too. Except for that part there at the end! It's hard to admit as a fan of the Twins that a rebuild would be the best path...especially so seemingly early in the Buxton/Sano era.But, IMO, past failures can't inhibit future actions.Just because the last rebuild was so recent and/or didn't work, doesn't mean that rebuild can't be the correct path faced with the current situation. Having said that, I do think that the choice of approach for the Twins in 2019 is NOT easy/obvious.But I think another year of half-measures is very risky. Going half-way and hedging and hoping...in either direction...is the exact recipe for winning 75-85 games a year and never accomplishing anything meaningful. I am not the one saying to quit, I am one saying the time is now with the current "prospect" guys we have and add to them with FA and supplement with prospects and trading prospects, because quitting on this group and hoping and praying the next group is going even our talent with the best teams is a fools errand. I think you have my position all wrong. I want the Twins to get whatever the 2019 Justin Verlander comp is. I want them to throw a suitcase of cash at the dozens of quality free agent relievers. I want them to find the best bats they can and worry about which positions they'll play come spring. I want them to make the moves to be the Astros and the Red Sox. But I want them to do it in the offseason, not in July after they've already farted away any chance at a first round bye. But if they can't do that now, I don't want them to go and start blowing the equity they will need later to get to that point just so they can put together another mid-season dog and pony show that's clearly not up to snuff simply to placate the fans and keep TVs on an extra couple of weeks. I don't want any damn piranhas. Piranhas are for division champs, not World Series champs. And why will the next free agent be better than Morrison? Or (fill in the blank). One can wish until hell freezes over that the Twins will go out and fill all their holes with some of the big names on the market. But if you continue to do that you are ignoring 58? years of history. Not all, but too many FA will not come to this locale, all momentary considerations being close to equal. And neither Calvin or the Pohlads have given any indication they are going to spend money out of their own pockets at the level needed to even begin to entice that level FA. So you can sit and wish for something that won't happen, or at least go a route that is available. I used to want a Lamborghini. I decided if I couldn't have a Lamborghini I wouldn't have anything. One day it dawned on me that refusing to acknowledge not being able to have a Lamborghini wasn't getting me anywhere. Literally. So I bought a Ram pickup.it ain't no Lamborghini, but at least I now have a chance of getting somewhere! Where we may differ... if we get piranhas and they in contention... I'm bringing them some more food in full support. I will never look at a stacked Red Sox roster and say... We can't compete in a 20 game sample size... no sense in trying. I understand the desire to not mortgage the future and I don't want it mortgaged either but when I look at the prices paid by the Brewers this year to get Moustakas and Schoop... I don't think you have to. Because they are entirely different human beings? Not a guarantee, but neither is your logic. I don't understand why everybody's making conclusions on this recent group of graduated prospects. The ink is far from dry yet. Some of the guys have proven to be building blocks already, but remember that Buxton is 24 and Sano is 25. Maybe they never amount to what we envisioned, but it's still way, way too early to throw in the towel. 1] Whether you state/claim/believe the rebuild has begun or not, there is a lot of young talent/potential on the roster, even though we may have not seen the results we'd like to. 2] There remain holes and opportunity on the roster, especially 2B and the bullpen. 3] There is indeed a "second wave" of prospects set to arrive in 2019 and 2020 which include, but is not limited to, Gonsalves, Thorpe, Graterol, Rooker, Khirilloff and Lewis. Where the differences reside...if I may...resides in the viewpoints of these 3 points. 1] We haven't seen the results wanted and anticipated from the first wave of the rebuild candidates, therefore they should be moved, replaced, traded if possible, etc. 2] Said holes of opportunity on the roster should be filled by a "blow up" of the roster, moving on from the players mention in point 1, via trades and major FA signings. 3] The next wave coming will be better and bring new hope along with point 2 being implemented. I believe the truth rests somewhere between all of this. To paraphrase the old adage, "there is point A on the left, point B on the right, and the truth is somewhere in the middle." Affixing blame to the young players not yet achieving fully anticipated expectations is fruitless! For the most part, they have played under one manager, but two different FO. Bemoaning "the system" they were developed under is a moot point as they have reached the ML level now. What IS important, is what happens now? Especially with a new manager and at least partially new staff to be in place. Tom Kelly famously stated a player really needs 1,500 to 2,000 AB to really figure things out, and for you to figure out what you have in that player. As someone mentioned in another post with me, that doesn't mean EVERY prospect gets or deserves said number of bats! Some guys deserve it and get it, and some you obviously know quickly they don't/won't. In regard to point #1, and the first wave; believe in them or not, Rosario is the old man of the group at 27. And after a lot of debate he simply wouldn't get it, or do it, he did and has. (Though injury robbed him the second half of 2018). But these guys were highly regarded and top prospects within the Twins system. A couple of them ranked amongst the best prospects in all of baseball. And despite frustration and disappointment, ALL of them have shown flashes of what they can do at the ML level. Sano an All Star in 2017, Buxton earning a handful of MVP votes for his second half in 2017, Polanco performing so well the second half of 2017 and putting up good numbers his half season of 2018, flashes and hit streaks by Kepler, etc, etc. To deny that is short sighted and stubbornness. (Again, not saying expectations have been met as of yet!) NOW, consider talent, potential, rankings, flashes shown, and consider TK's opinion. *NOTE: I include Garver because he's smack dab in the middle of the first and second wave, and Austin for what should be obvious reasons. What stands out to me is Rosario, the oldest of the "first wave, is the most complete and productive player of the bunch with the most Ad's and has been either the most healthy, or hasn't had a suspension, or missed any appreciable time. (Until his injury in the ,last half of 2018). Kepler could be what he is, a nice piece. Sano and Buxton could each wash out, or one of them make it maybe. But isn't it also just as likely that BOTH of them, especially with a new staff, a new season, and better health begin to tap their potential in 2018? Point #2 isn't even valid, IMO. There is arguement/debate over the history of the FO dumpster diving and signing mediocre FA to simply achieve some competitive status quo. But the current FO has literally been on the job for almost exactly 2 years! Other than changing managers, declining a couple of options and signing a single OF flier, the 2019 off season hasn't even begun yet! What they did last off season, rather obviously IMO, was make some smart, short-term moves to augment a surprising 2017 run without giving up prospects, or handcuffing themselves financially in any way. Yes, injuries happen to all teams. Sometimes they overcome, sometimes their seasons are disrailed, in any sport. But how much better is the rotation with Berrios, Gibson, Odorizzi and a healthy Santana? How much better is the lineup with the "normal" Sano we have seen, a healthy Buxton having any kind of season, a healthy Dozier, (who finally admitted to playing hurt), and Morrison just hitting to his career norms? If the Twins do nothing more than just split their absurd 1 run loss record they have a winning record. When things went south, they did what they should have done, which was make moves to add even mkre talent to the system. Though even as I type this, I still feel they made a huge mistake in regard to Pressly! Point #3 IS important! The Twins legitimately, yet again, have a very deep system with a "second wave" of talented players getting oh so very close. And it may be as highly regarded as the players in the "first wave". But NOBODY builds a complete team with a "single wave" of talented prospects. And not every good/top prospect turns out. We all know this. Which is why it takes a couple "waves" of prospects, trades, and smart signings to build a complete roster/team. The talent on hand, still young and inexperienced no matter what, needs to be healthy, coached and developed. That's why we have a new manager and a re-vamped coaching staff still to be named. There is available money to be spend this off season to add a couple 2-4 really nice pieces to build the roster, as is, awaiting the arrival of the "next wave", for 2019, 2020, and beyond. Even the teams with the most "complete" teams you can think of make trades and signings...sometimes short term...to fill holes. It is WAY TOO EARLY to give up on a collection of 27yo and younger players and blow the whole roster up in some sort of re-build when, honestly, the re-build is taking place, and has been taking place the last couple of seasons. There is nothing inherently wrong with the FO taking some fliers on guys. Sometimes they pay off. And I have never believed that just splurging in FA will "buy" a team. There is so much more involved. And yes, sometimes you just get burned on a guy. But the Twins, and the FO, are in an enviable position right now. They have a collection of young talent at the ML level just waiting to be healthy, motivated, and coached to unlock their potential. (Reflect on the young Berrios and all the position pkayers already discussed and their ML time, flashes and AB). They have a very talented second wave of prospects to arrive over the next two seasons. And they have the finances and flexibility to go out right now and make a couple moves for 2-3 year deals...unlike the calculated 1 year deals last year...to augment the roster. Where they are also fortunate, what they need most is a bat, (preferably one who can also play in the field), a 2B, and bullpen help. And with a deep FA field overall, and with depth at all 3 spots available...and I still believe an adjusted/financially restricted market...opportunity awaits. The key is the smart and right guys to sign! And that's where the FO earns their money and reputation this year. Sign McCutchen, or Brantley, and deepen your lineup and OF. Pick the best 2 RP you believe in. Examine the best 2B options available for the next 2 years. No blow up needed right now. Just be smart and aggressive without being stupid. Do your damndest to work with what you have on hand. Make 2019 the best you can, and keep working forward. I think people are missing my point. My point is continuing to say the Twins need to tear down and rebuild and wait for the next group of prospects to be better than the best teams is foolish. The current group is one of the best group of prospects the Twins have ever had, the next group looks good, but to think they are guaranteed to turn out let alone be better than the current group is crazy. So my point is get better players though FA and trading some of the prospects and try to win. Doc, you said and typed up what I was trying to say. You did a way better job! Well if your goal is to get to the end of the road, and you don't care who gets there ahead of you, great. But if you want to get there first, I think you need to find a way to get the Lamborghini. And I want the Twins to get there first. And that's fine, I just don't like the logic of "Well X failed, so Y will too"Because you can apply that to trades, FAs, prospects, or virtually anything the FO might do. Tom, an intelligent and well thought out and argued plan. But I am going to disagree with you none-the-less. I DO believe the rebuild has begun, which is in the form of Sano, Buxton,Kepler, Polanco, Berrios, Garver, etc. Now, we haven't seen the desired results or consistent performances as of yet. Is that the players, the coaching, injuries, or system development, or dumb luck it's taking longer to hone their skills? That's the tricky part! And I dont have an honest answer. I would add 2 quality bullpen arms. I would roll with Moya, Vasquez or Mejia as a 2nd LH arm with Roger's. Combined with May, hopefully a rebounding Hildenbeger creates a much better pen with auditions for the end spot(s). I sign McCutchen to play OF and DH. He's productive, has a couple good years in him, and the lineup and roster become deeper and more flexible. I'm OK with Lowry as a stopgap at 2B. But I'd prefer a trade for someone like Starlin Castro. He's got offense, is much younger, and could have value as a starter even after Lewis arrives. We have 3 SP who could be gone after this year. But I'd re-sign Gibson. Odorizzi and Pineda could be kept, moved to the pen, or offered up in trade during 2019 if/when Romero, Gonsalves, Thorpe begin to step forward. This is not a series of 1 year deals. Its 2-3 year deals to augment the current roster, a wait the second wave of prospects, and still have trade flexibility for the next couple of seasons. Much depends still on continual development for Sano, Buxton and Kepler. (Along with some better health). But I see moves like this adding to the roster, not just fill ins. I dunno if this plan is achievable, but I kinda like it. McCutcheon is actually a pretty good fit for this team, and while he would cost quite a bit more than Grossman...I like him a lot better. Grossman was awful until September, has no defensive value, really and is basically a 1 trick pony. McCutcheon may have faded defensively, but he can still be solid in a corner and should be a consistent hitter. at 31 he's still likely to have a few more good years in him...maybe a 3-year deal? It wasn't long ago that Rosario would have been shipped out for a warm left handed pitcher.as for Sano and Buxton? I will keep Buxton, and others who aren't interested may keep Jake Cave. It's a deal I would make any day. Sano is a little more difficult. Talent isn't the issue. Commitment and work ethic appear to be a possible impediment to his reaching his potential. If he figures that out, he will scare MLB pitchers for a decade. While he may well do it, I am not anywhere near as confident of him as Buck!